A client recently sent us a link to a graphic that broke down how long it takes to rank on Google. Of course this is an age old question in the SEO industry. And it’s not the easiest question to answer as there’s a wide range of factors that impact that projection. Even with that said, we expect clients and prospects will ask the question. For us, it’s less about the exact number of days or months, but more about how you approach the question that tells the client or prospect if you know what your talking about. Without Every Possible factor (how many are there really? ), this graphic does a nice job of explaining how long it can take to rank in Google without an extreme amount of detail. Our agency projections are right in line with what ahrefs put together. 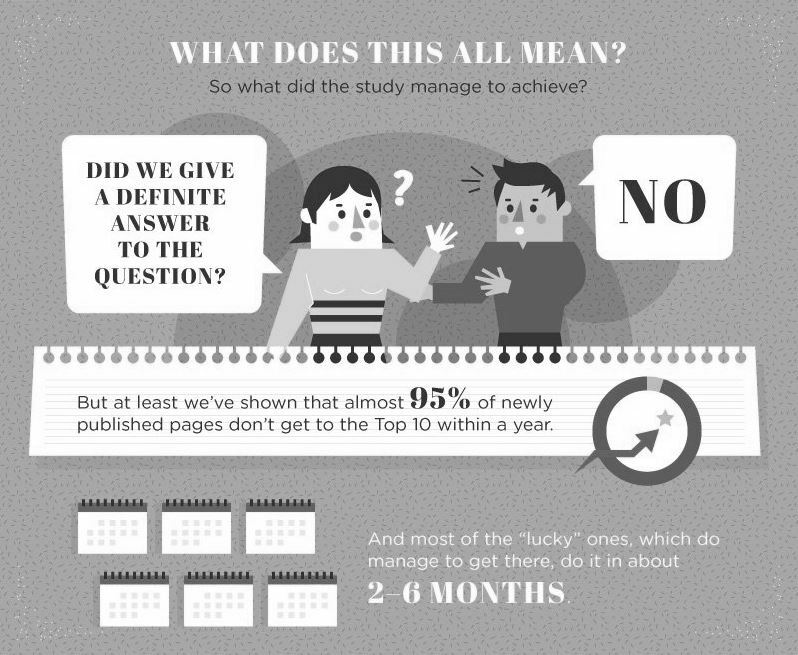 To summarize this graphic, on average 95% of pages don’t make it to the first page of Google’s search results for 1 year. And, the so called, “lucky” pages, do it in roughly 2-6 months. These are in the extreme minority of pages. So, without looking at additional factors, in-depth analysis on market competition, etc. This graphic gives a nice baseline to look at, and fits within our SEO Agency model of, you’ll start to see results in 2 – 6 months. We always say that by month 2 you’ll start to notice increases in rankings and will more than likely start to see some increase in organic traffic. With that said, 3 – 4 months is a tipping point where traffic starts to reflect that growth in leads we want. So 2 – 6 months is fair and we’ve seen head keyword phrases take as long as 2 – 3 years to rank within the top 3 results. Again, all based on quite a few factors. The industry, authority of our competing competitors, big brands and on and on.